The Merlin Major is the 0-6-0 version of the better know, 0-4-0 side tank Mayflower and saddle tank Monarch. It was announced by Tom Cooper in the Jan/Feb 1986 edition of Steamlines magazine, just as his relationship with the Merlin locomotive Works was coming to an end. In fact, by the next magazine he had left to establish his own company. The Major has exactly the same body as the Mayflower, but longer frames and boiler. The same cylinders are used, with very clever construction allowing the piston valve chests to be replaced. The early models (from sometime in 1986, had a simple valve gear while the later ones had a simplified Walshaerts gear with a reversing quadrant. Both are radio controlled. 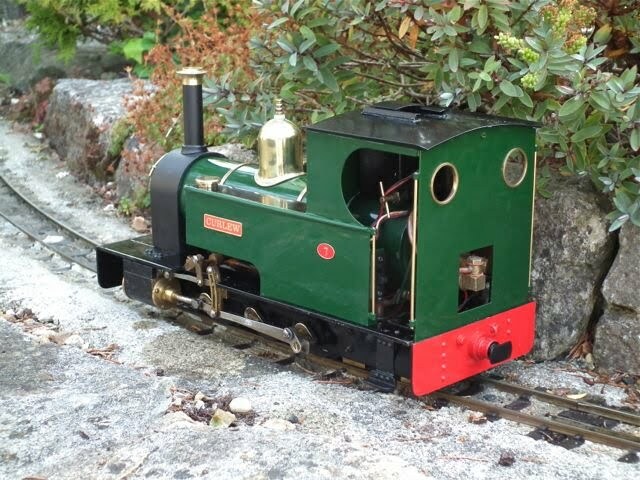 This story sarts with an email from Bill Wilson, a well known steamologist who specialises in vintage locos such as Bowmans and Bassett Lowke. He had been offered parts of a Mayflower and most of a Major and wanted to know what I thought. Well before I knew it, I had first option on the Major - if the deal was done, and if I liked what I saw in the metal. Suffice to say that I did like what I saw - as I like a challenge. 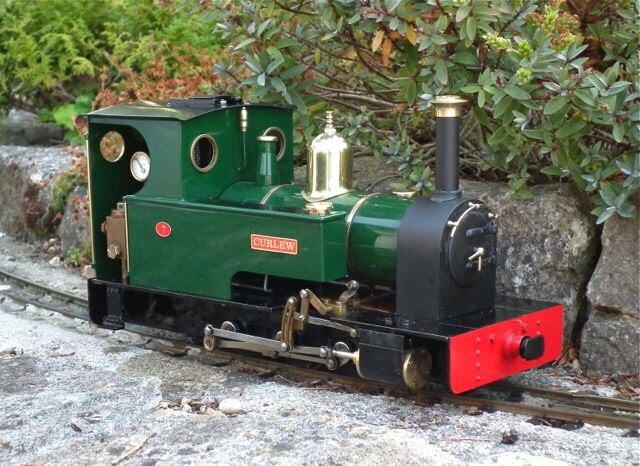 I knew only too well that old Merlins are usually knackered, but I also knew that Simon Whenmouth of Anything Narrow Gauge has a small number of replacement cylinder and valve parts. Now there is no logic to this, but when I got it home I just had to polish the brass parts before I did anything - I mean, Merlins just have to be shiny! The underneath was pretty grubby, but that could wait. As these Merlins only have a radio controlled, rotary regulator/whistle valve (seen under the front of the loco above), the next thing to do was to replace the 27mhz radio receiver (seen hanging off below) with a 2.4ghz one so that I could test the loco. The body was not fixed to the loco as all four small brass blocks had been removed (or fallen off as is normal) and replaced by crude brackets which had never been drilled. The receiver was easily fitted to the side of the gas tank with a type of modern, rigid 'Velcro'. Note that the cab back, rear buffer beam and buffer were all missing. After oiling round, filling the lubricator (that brass box on the right of the lubricator), filling the boiler (less 30mls) and the gas tank. I lit up for the test. Amazingly she ran - in both directions - but the usual Merlin proble was evident. When in mid-gear with the regulator open, steam gushed from the chimney in a steady stream. Something was very worn - almost certainly the piston valves - and a quick call to Simon Whenmouth of Anything Narrow Gauge confirmed this. The good news though, was that he thought he had a set of valve chests/valves and a set of replacement pistons with O rings (the Merlin ones are PTFE). The following weekend was the 16mm Garden Railway Show at Peterborough where money changed hands and I had a small bag of Merlin parts to bring home. Here are the replacement parts, ready to fit. Removing the cylinders is simple, thanks to a very clever design. After disconnecting the connecting and valve rods, removing the two screws above the footplate allows the cylinders to be pulled off. As you can see below, they are pushed on to brass tubes and sealed with O rings (which were luckily in good condition). With the cylinders removed, the end cap screws were removed to allow the pistons to be extracted. It was then a simple job to remove the PTFE piston and screw on the replacement. Removing four screws then allowed the valve chest to be separated from the cylinder block. The two are sealed together with O rings (see below). At this stage I didn't notice a small difference between the old and new valve blocks - but more of that later! The O rings looked OK so I fitted the valve chests, then etch primed and sprayed them satin black. Below you can see them with the etch primer on. Then the pistons and end caps were installed with a thin smear of engine oil on the paper gaskets. The screws were tightened diagonally to pull the caps dow evenly. Then the cylinders were re-installed by pushing them on to the pipes and securing with the two 6BA screws above the footplate. Now I was ready to set the timing and for the instructions, I am indebted to Tag Gorton who wrote an article on the subject in 16mm Today No.79 (yes, that's back in 1997, when these locos were already old and often difficult). This was before the days of the Accucraft inscribed line on the piston valve so it is all done by measuring. In fact there are two key measurements: the total travel of the valve and the valve position at 12.00 o'clock. The first thing is to measure the total valve movement while rotating the wheels forward. This has to be 4mm and I found it easiest to file a brass strip to 4mm wide and use that as my measure. Adjustment is by moving thposition of the return crank and this is loosened by loosening both the central screw and the grubscrew. The second is to measure how far the valve protrudes when the crankpin is at the 12.00 o'clock position. Rotate the wheels forward and if necessary loosen the locknut and turn the valve to adjust. There is a third check with the later types like mine - and that is to ensure that the reversing quadrant is correctly positioned. Looking at the loco with the crankpin at the 9.00 o'clock position, going from forward to reverse gear should not move the valve. If it does, then slotting the loed on the quadrant mount will allow some fore and aft adjustment. Of course none of this allows for wear in the motion so just when you think it is right...it is not. But for me there was another problem. Try as I might, I could not make the loco run either forwards or backwards. I wrongly assumed this was the wear and spent many hours adjusting and re-adjusting the timing. The motion would jerk and stop. After hours of fun trying to sort this, I eventually disconnected the connecting rods from the piston rods and steamed up. One piston would shoot back and forward just fine, but the other didn't move at all. So it wasn't the timing! I took the cylinder off and removed the valve chest to find one of the O rings had flattened and sealed the steam port. Closer examination showed that while on the original, both steam chest and cylinder had a recess for the O ring (see photo below), on the new valve chests there was no recess (you can see this in the photo, two above). Simon Whenmouth was perplexed by this, as he had never seen recessed ones before, but he sent me smaller O rings which sorted the problem. ....well it ran sweetly except for the fact that the banjo fitting washers weeped on to the burner and put it out, and then, on re-lighting, it flashed back and caused a fire in the cab where the gas banjo washers were leaking! The Merlin washers appear to have been hacked out of sheet PTFE and were past their prime. Simon Whenmouth supplied new red, fibre ones, but I have to admit that it took ages to make them seal. The need to be gently tightened when hot and might be better with a smear of silicone sealant on them during assembly. The Merlin Major has exactly the same body as the Mayflower,so I was lucky to have the Mayflower back to use as a pattern. I purchased a sheet of 0.8mm hard brass from my local model shop and made one to match. As usual, the spectacle holes took a lot of filing to get exactly to the 20mm opening. Normally I would chain drill holes round the edge and file it from there, but for this I drilled a central hole and 'nibbled' outwards with a sheet metal nibbler. With hindsight, drilling would have been better and even a Dremel to do the initial shaping. Anyway, they were finally done and proved to be a exact firt for a pair of Mamod spectacle rings that I had in stock. The crude handrail loops were bent from thin brass strip - I simply bent the strip to a U round the 1.5mm rod and then pinched it up, round the rod, in a vice. Here are the two backs - mine is ready for etch priming. There was no option but to strip the body back to the bare metal, and luckily I had some old, fast acting paint stripper in stock so this took less than an hour. With modern stripper it is worth covering it in stripper and then putting it in a polythene bag over night. With the paint off, some of the problems were revealed in more detail. Here, an owner has scraped the paint and keyed the brass to stick the nameplates on with epoxy. i think this method qualifies as a "crime against locomotives" ! The side of the cab had clearly had a bad knock and someone had attempted to knock this out from the inside with a sharpish instrument. The keying for the nameplate was easily removed using different grades of wet and dry, but the dents were more difficult. I set the body up with a flat steel bar inside, and then used a planishing hammer (for panel beating) on the outside. This was ok, but I then foolishly decided to use a smaller tack hammer for some of the tiny marks. All I succeeded in doing was making more marks! So it still looked pretty rough when I applied flexible car body filler. The slight creasing of the lower left hand tank was beyond me to correct, so I used a little filler on the worst part and then couldn't really see it. 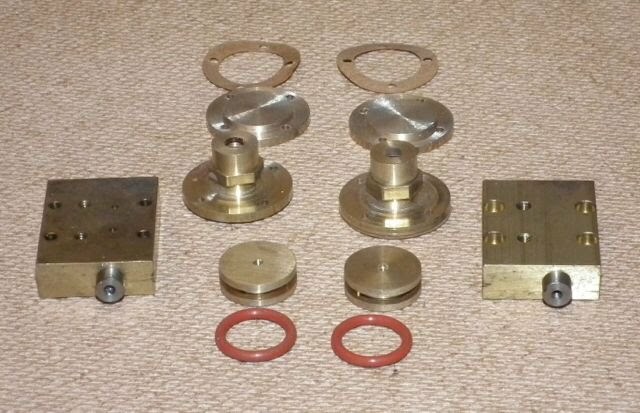 I moved on to make the brass blocks for the body mounts. I had some square scrap brass (from an electical fitting I think) and as it was a fraction too big, I drilled the holes slightly off centre (well that's my excuse!). I then tapped them 6 BA and solt soldered them in position. This was a bit awkward on the rear two as I also had to solder on new handrail loops. I managed. Now normally, the first coat of primer shows up the imperfections, but my glasses were "rose-tinted" at this stage and I just wantted to get the paint on. In a perfect world, I would have added more filler to the cab side which, as it turned out, was not perfectly flat. Then I faced a dilemma. Should I spray the black and then mask that to spray the green - or should I do the green first and then mask that? Well I opted for the green first - but next time I would do the black first!! After much checking of colour, I settled on Halfords Acrylic Rover Brooklands Green as an exact match. If I had been painting the boiler, I could not have used this paint as it softens in the heat, but it is OK on platework. Even though the ambient temperature was 25 Centigrade, I still used my fan heater to flash off each coat and then 20 minutes in the oven at 80 C.
I then left it overnight before masking to spray the roof. It took a LOT of masking! This was sprayed with Halfords Acrylic satin black and then removed the masking before baking (this is essential!!). The next day I carefully masked everything again to do the tank tops, but this time I got two things wrong. I had the tiniest gap which allowed overspray on to the cab front - this was removed with T-Cut. The second was more of a disaster - I used cling film for some of the masking and it stuck to the roof in two place, leaving a mark that wouldn't polish out. So I had to mask up again and re-spray the roof. It was finally done and with the brass bits added, it definitely looked more Merlin. The left hand side (not shown) is OK but not great, especially with glossy paint and sunlight, which shows every defect (just like on the real thing, in fact!). The original Merlin buffer beams were very thin and I had just one, which was bent. I used the one as a pattern to cut two from an old brass door plate (a car boot sale purchase). This brass is 1/16" thick and much more substantial. I drilled for some cosmetic 1/16" rivets and soldered these in before clipping off the tails and flattening the back with a fine file followed by W&D. The Merlin smoke box is very attractive, but very crudely finished. The rough aluminium casting was clearly very rough and was finished on a course belt sander leaving terrible scoring under the paint. Also the brass cap was just stuck on - or at least had been, though mine was now loose. The smokebox is removed by simply undoing two screws below the footplate. The handrail will slide out of the knobs and these unscrew for cleaning. I was surprised to find all three were different and clearly hand-turned. I put them in the chuck of a small battery drill to polish them up. I had run out of old paint stripper and the modern stuff would barely touch the Merlin smokebox poaint, even after 24 hours. I ended up filing and using W&D paper to smooth out the worst of the sanding marks on the casting before etch priming and spraying with BBQ black paint. I baked this at 200 degrees C.
I cleaned up the crude smokebox dart (I must make a better one) and turned a new, more elegant (to my eyes) brass chimney cap. The Merlin Majors have been found with two different exhaust sizes: 1/8" and 5/32" so it is essential to check the exhaust before ordering. I had forgotten this and so had an SCGP4 for the 1/8" exhaust, when I measured mine at 5/32"! It was a simple modification to silver solder the correct adapter and then to cut the exhaust down to position the Chuffer in the chimney. Now this should probably have come first, but it was only at this stage that I got round to it. I had bought some degreaser spray at the local market and at nearly £4 a bottle I thought it would be as good as Gunk. It certainly smelled a lot nicer (for use in the kitchen sink), but was pretty useless. I painted it on thoroughly with a stiff brush and then jetted it off, but had to go back two or three times and then with white spirit. The wheels had been crudely painted black, so I rubbed this down, as best I could, and painted them with Humbrol matt black enamel, both inside and out. I gave them two coats, but they might have been better satin black, or even red as on Keith Greenwood's loco at the top of the page. This was turned on the lathe to match the one on my Merlin Mayflower. John Lythgoe does a series of ready made plates with bird names, so I phoned and ordered a couple of sets. John really does great service and they were with me the next day. I fitted them with clear silicone. The number plates were from a roundhouse set, sprayed red. I decided not to re-use the strange Merlin plates, which I gather were not original. The steps were missing, but luckily I had a pair of Roundhouse white metal ones, left over from a project back in the 80's. They were already painted black and just needed holes and slight modification on one side to be fitted using the threaded holes in the footplate. The body fitted fine, with the new blocks lining up perfectly with the holes in the footplate. I used short 6BA screws and then went round with some gloss black Humbrol enamel, touching in the screw heads. The cab backsheet was more of a challenge and the holes (positioned from the Mayflower back) were slightly out. I just elongated the holes with a round file and drilled and tapped a new hole fot the top 8BA screw.